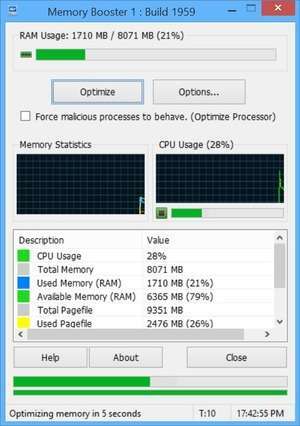 Rizone Memory Booster is an optimization utility which helps free up memory for your Windows desktop PC. It can be especially helpful for older systems or systems without much memory. The program is completely portable which means it may be run from external drives such as USB thumb drives or USB sticks. It does not require installation and thus does not need to be uninstalled after use. Version 1.9.5.1959 is a freeware program which does not have restrictions and it's free so it doesn't cost anything. For security reasons, you should also check out the Memory Booster download at LO4D.com which includes virus and malware tests. Additional screenshots of this application download may be available, too.